Cloister of the Convent in Tepoztlán, Morelos. From the time the Spanish arrived to the ‘New World’, particularly to what they came to call México, an amazing blend of cultures took place, unlike other places of the world where there has been an invasion, in this case the locals and the invaders mixed and a new culture with two or more heritages was born. Old worlds entwining to create a new race that to this day has much to be proud of. Unfortunately our real roots are often mistaken. A large number of today’s Mexicans would much rather look Spanish and on the other hand we have people thinking the real roots of our country lie within the native prehispanic traditions and reject half of their legacy. I have felt worried about being artificial because many of my preferences seemed alien to my culture but I have recently come to find out that many -if not all- of the things I love and that move me can be found in that specific time of the history of my country. I was just unaware of it. You can’t love what you don’t know. My country is easy to love just because of it’s beautiful landscapes and kind climate alone, among many other things, each worthy of their own blog post. But a lot of people, my self included, ignore most of our historic and cultural inheritance. As I’ve come to learn more about it through books, friends and teachers I’ve also gained a better appreciation for my culture and its art and history. This song is something I started rehearsing today with a choir I’m very happy to belong to. 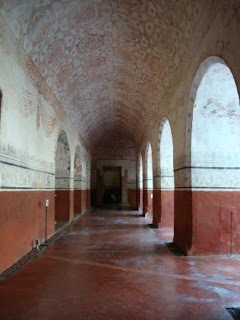 We rehearse at the Convent of Tepoztlán. It’s such a wonderful space to be at and often the highlight of my week. note: this (in the video) is not the choir where I used to sing. Palm Sunday Hymn version by Francisco López y Capillas, kapellmeister of México’s City Cathedral, XVII Century.